Verizon, AT&T and T-Mobile vs the world, do phone choices and updates limit American freedom? With the world's second-largest phone maker Huawei and brands like Sony, HTC or Nokia all but missing in the US carriers' phone portfolio, it's not hard to fathom why the popular opinion is that American users have less freedom of choice than carrier subscribers abroad. Not only that, but we also love to complain how the rigorous FCC and carrier testing procedures in the US are holding back timely software updates for our phones. That's why we decided to plot the number of models on each major US carrier - Verizon, AT&T, T-Mobile, and Sprint - against a few carriers in Europe or Asia to see if the limited phone stable and late upgrade notions hold up to scrutiny. For years, carriers had charged customers and suppliers for using and selling services over their proprietary networks. By giving so much control to Jobs, Cingular risked turning its vaunted - and expensive - network into a "dumb pipe," a mere conduit for content rather than the source of that content. Sigman's team made a simple bet: The iPhone would result in a surge of data traffic that would more than make up for any revenue it lost on content deals. The zero-sum negotiation skills of Steve Jobs left Apple in charge of iPhone updates and forbade AT&T to put on it anything but its network logo in the status bar, and that disruption has carried on ever since, if a carrier wants to carry the iPhone, too. Of course, it helped that there was no iPhone Core, or Fascinate, or Lite to decide on or prioritize for carriers, so they left Apple to its devices when it comes to updates, and, since it is both the iOS hardware and software maker, updates come fast and furious. With Android phones, on the other hand, Google has to announce the next version, then release its image to manufacturers, often after it has updated its own Pixel phones first. Samsung, LG, and the others get it, apply whatever new features and interface updates they have in mind for their own overlays, test them, then the firmware to carriers to install and probe how it works with their own apps and all the network settings, again. This gets bounced back to Samsung for fusing with the feedback and bugs report, and, after a fair amount of squashing, Samsung finally sends the ready update to get pushed over the air. By the time the whole procedure is finished, we are usually past Christmas, and deep into the Chinese New Year. We already demonstrated that Samsung is not the worst phone maker when it comes to software updates on US carriers but let's take a step further and add how long users in the UK or Germany had to wait for Android 9 Pie with One UI on their Galaxy S9 or Note 9 handsets. As it turns out, usually as long as Americans, bummer. Do foreign carriers really have more phone choices than Verizon, AT&T or T-Mobile? As you can see, the postpaid choice on Verizon is pretty pathetic in comparison with most carriers both home and abroad indeed, but we may have its legacy CDMA network to blame, and that one is being retired by the end of 2019. T-Mobile has no such excuse but it does position itself as the discount and promo carrier so it strives to hit the value-for-money spot, as exemplified by its choice to be the first US network to officially sell the OnePlus 6T. AT&T, on the other hand, is doing pretty well in postpaid choices, even though it, as all US carriers, suffers from the case of Huawei-titis and general Chinese brand malaise due to reasons beyond their will. The average number of phones sold by carriers abroad is usually higher than on US carriers mainly because brands like Huawei, Sony, Xiaomi, Oppo or Nokia haven't gotten through to the American market for one reason or another. On the other hand, plenty of international carriers carry a much smaller number of LG phones compared to the US ones. (Apple-10, Samsung-10, LG-7, Motorola-4, Kyocera-3, Sonim-2, Alcatel-1, CAT-1) As of 1/10/2019, Sprint Forward plans have been discontinued. It is also easy to see that Samsung and Apple hold a near duopoly on the world's market, as they are consistently at the top two places among phone choices on most carriers outside of China. The sheer size of the Chinese market, however, with China Mobile alone gunning for a billion subscribers, explains why Huawei is actually the second-largest phone maker now, even though it's often the third or fourth most popular brand beyond the Great Wall. There is one more reason for Apple and Samsung phones to be so popular among carriers, besides the obvious virtues - they are just compatible with them all out of the box. Apple started this trend by providing a record number of LTE band support with each and every iPhone iteration since the 5s, and we are now at the 27-band mark with the unlocked 2018 models, which the globetrotter or carrier hopper in you will surely appreciate. Samsung's Galaxy S and Note lines are not far behind, as the unlocked models sold on the US website can work with each US carrier out of the box, too. Verizon is killing the CDMA network in 2019, so... freedom? In fact, we can clearly see that a large GSM carrier like AT&T has plenty of phone choices even by international standards, while the CDMA voice requirements of Verizon or Sprint make for a more conservative portfolio. America's largest carrier, however, is retiring its legacy CDMA network at the end of the year and will move to HD Voice-capable phones only requiring less network compliance efforts by handset makers. The transition to HD Voice-only gear and 5G may improve the situation with phone choices on Verizon, while with the pending merger of Sprint and T-Mobile, that situation may change for Sprint, too. In a nutshell, the lack of up-and-coming Chinese brands on US carriers is pulling their portfolio diversification back but this is not going away any time soon, and phone choices should only become richer going forward, on account of mergers and new network technology. As for the notorious US carrier Android update delays, the situation is not rosier abroad but that has to do with the extra steps in the Google-manufacturer-carrier triangle compared to the straight Apple-iPhone line, so freedom of choice has its consequences. What do you think? Would you like to see more phone choices offered by US carriers? More choice is good. I think it's kind of boring to have just those options as the known ones. Like Huawei (politics aside) makes some great phones. It would be cool if some of those options were here too. It seems like Huawei is pretty popular in Europe. You are still not going to see more phone choices on Verizon. It's not like they don't have the HD Voice Capable technology now. They have it alongside the CDMA tech. Verizon is just a lame POS when allowing phones to work. Instead of blacklisting a set of phones, Verizon chooses to whitelist them. I had the HTC 10 Unlocked version and Verizon claimed it wasn't able to work on their network. A few months later after rooting it and changing a setting, it would work - of course I had already reluctantly exchanged for the Verizon version of the HTC10 which, or course, ended up having crappy Software and broke a year and a half later. Verizon is like the helicopter parent that is so bad that the kid can't even have friends because it's so annoying going over his house. You beat me to it. I have a similar story about Verizon too. Around 2014 I took my GSM/CDMA compatible Nubia Z7 Max there and they told me it wouldn't work and wasn't whitelisted. Called customer service and they were rude about the whole thing so I gave up. Turns out it did work as do many other phones once the sim has been activated in a Verizon phone so the CDMA story is a myth. In Verizon's case they simply want you to buy their phones and will do anything to achieve that. 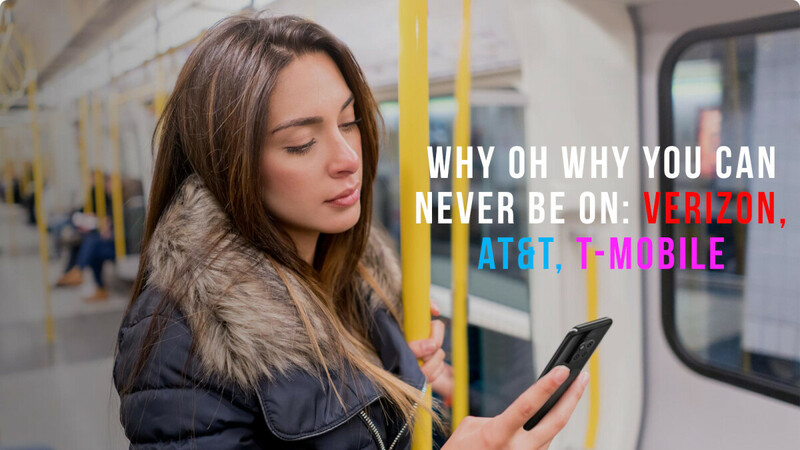 Virtually every single gsm phone on the planet is at the minimum compatible with AT&T and T-Mobile HSPA and many with LTE. They don't care what you bring and would probably stock many more phones if not for the logistics of the whole thing. The simple answer to the question is it would be nice to have a wider choice but it's impractical to do so. I only buy unlocked international models anyway just because of the limited choices. at&t is kinda the same even tho most unlocked phones work with their network they made it hard for me. I had a Xperia phone which supports all their lte bands and they told me at the store it wouldn't work., called customer service same thing I put my At&t sim I got lte signal but no volte. Nobody could make volte work. Sold the phone to a friend first day he walked in to a tmobile store they got everything working for him. Not like at the at&t store were they told me it wasn't gonna work at all. T-Mobile store was different i went with him he told them I have my own unlocked phone. They looked at the phone then typed the imei on their computer and told him its gonna work were gonna get u a sim and get everything set up. Very easy..
Yep. T-Mobile are excellent in that regard. They also cater very well for tourists who just need a temporary sim and data. It would be interesting to see how much Verizon lose in tourist revenue with their myopic policies. As an aside, I use Google Voice on wifi and LTE. Isn't that technically volte? If not, what's the difference?